Patterns of love and affection are all around us, especially around Valentine’s Day when we like to show these emotions to our close ones. 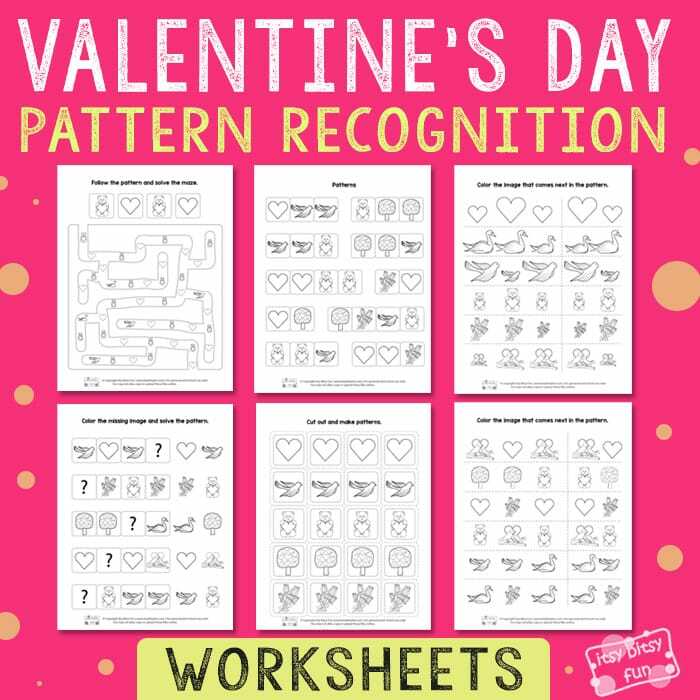 This free printable Valentine’s Day Pattern Recognition Worksheets will come in handy for keeping the kids busy and for some fun learning during this holiday. 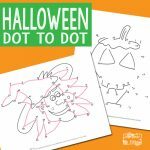 Recognizing patterns is a valuable knowledge, and with these worksheets, your kids will be doing some basic exercises to strengthen their skills. 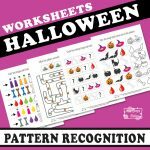 Let’s solve the pattern worksheets and have fun learning! 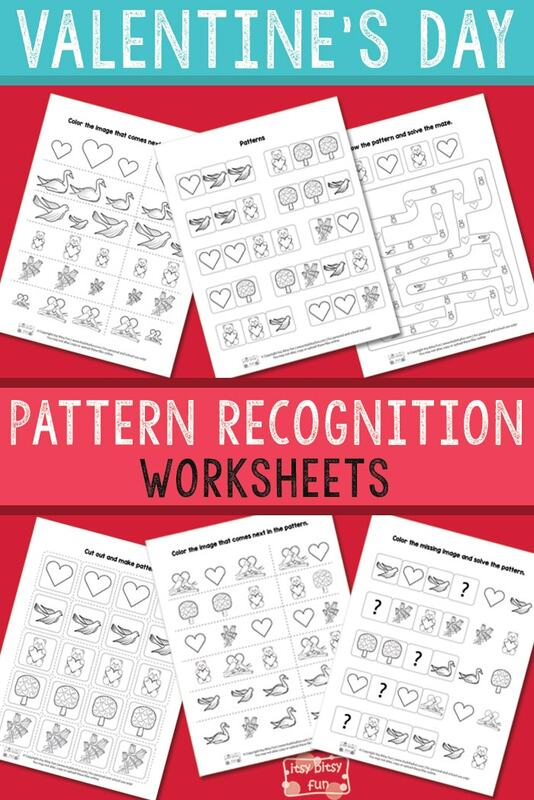 You will get 6 Valentine’s Day pattern recognition worksheets in this pack. Kids will learn how to continue basic types of patterns – ABB, AAB, BAA, BBA, ABBA pattern, ABAB pattern, and AABB pattern. On the first page, kids need to find the missing pattern, that is marked as a sign “?” and color the accurate one at the end of each row. The second page, there is a simple maze. Kids will solve it by following the given pattern at the top of it. They will need to follow the ABAB pattern and draw a line all the way from start to finish. On the third and fourth page, kids need to color the image that comes next in the pattern. There are bears holding hearts, birds, hearts, rose bouquets, doves, swans, and trees in different combinations of patterns. 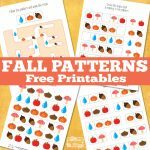 On the last two pages, you will find a pattern game. The fifth page includes 10 different patterns. Firstly, cut out all of the images from the last page. Now encourage your kids to “build” each pattern from the fifth page with their “pattern cards”. You can cut the given patterns into separate images and create your own patterns for kids to solve. Kids can also think of their own patterns and build them with the cards from the last page. 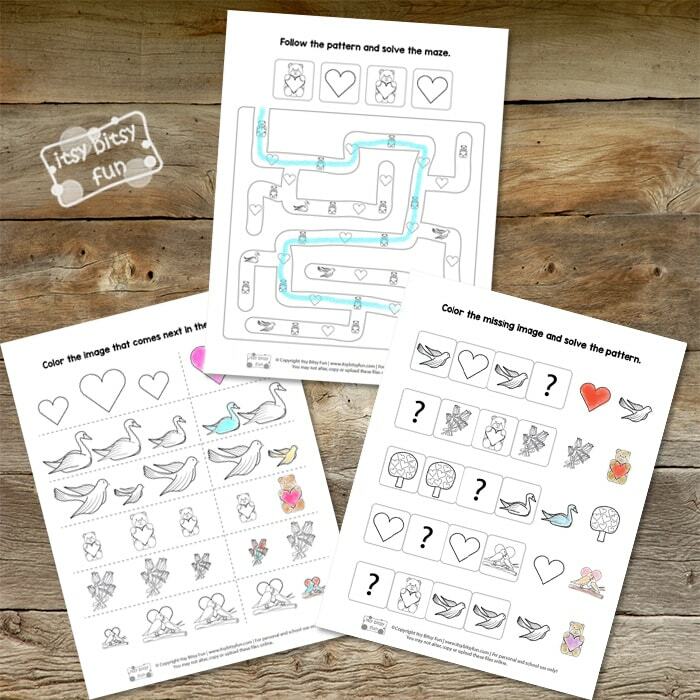 Print These Valentines Day Worksheets Here! 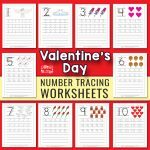 Get your free Valentines Day Pattern Recognition Worksheets here. 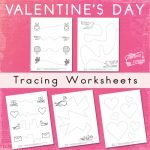 Have more fun printing out the free Valentine’s Day Coloring Pages and play with Printable Valentine’s Day Mix and Match Puzzles.